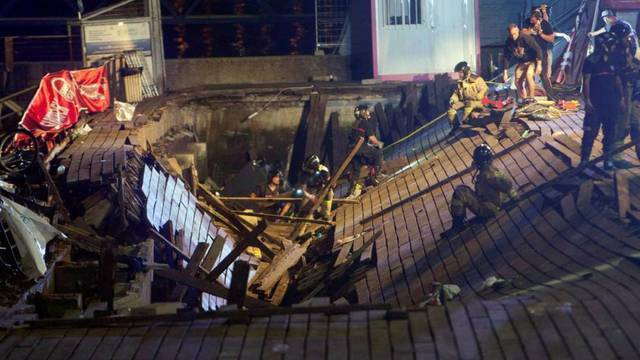 While concertgoers gathered around to see a rap artist at O Marisquiño Festival in Vigo, Spain this past Sunday night, part of the wooden platform collapsed, injuring more than 300 people. During rapper Rels B’s first song on stage, he told the crowd to jump, and suddenly, the wooden platform gave way. According to witnesses, there were scenes of panic as concertgoers tried to scramble off the platform, some falling into the sea. Several emergency teams were at the scene and attended the injured while divers went into the sea to make sure no one was trapped underneath the structure. Police confirmed that there were no fatalities, but 300 people were injured including five seriously. In a tweet, Rels B wished strength to those injured and urged anyone worried about friends or relatives to contact an emergency information point. It was unclear whether the platform collapsed because there were too many people on it or if the structure was weak to begin with. However, according to the Spanish publication EsDiario, the president of the PP of Vigo had warned the socialist mayor that the platform consisted of broken wood, presenting a “dangerous situation,” yet nothing was done in precaution before the festival. O Marisquiño is a free, three-day festival that takes place annually in Vigo right on the estuary Ria de Vigo. Each year, it brings in more than 160,000 attendees.